At the 2018 MTV Movie & TV Awards, Chris Pratt will be honored with the Generation Award, which is given each year to "one outstanding talent for their noteworthy contributions for film and TV." Over the past few years, the Parks and Recreation alum went from being a sitcom star to being a superhero in the Guardians of the Galaxy films and a pretty heroic raptor trainer in Jurassic World, a role he reprises in the upcoming sequel Jurassic World: Fallen Kingdom. 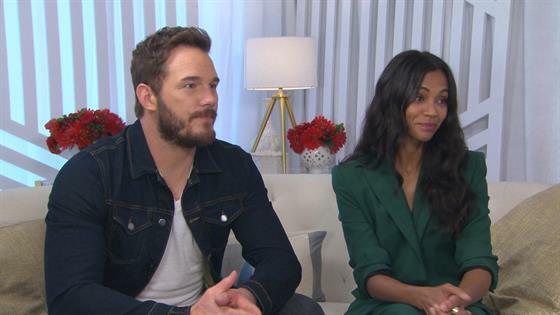 Many fans would consider Pratt a superhero in real life. 1. Giving Back: In 2017, the actor and his Jurassic World co-star Bryce Dallas Howard visited child patients at the famous Great Ormond Street Hospital and Children's Charity in London. "I'll never fail to be moved by the unbreakable spirit of a child. #godisgood," Pratt said. Pratt, a non-denominational Christian, also shared the Bible verse Psalm 107:8-9 on social media, writing, "Let them praise the LORD for his loving kindness, for his wonderful deeds to the children of men! For he satisfies the longing soul. He fills the hungry soul with good." "No doubt," Pratt wrote. "Today my longing and hungry soul is filled." 2. Take Two: In 2016, Pratt made a surprise visit to Seattle Children's Hospital. "Thank you @seattlechildrens for the opportunity to come by and brighten some days," the actor said. "My heart is full." 3. Take Three: Earlier this week, Pratt visited kids at a Ronald McDonald House, which provides a place for families of ill children to stay to be near their hospitalized child. 4. Role Models: In 2016, Pratt and Passengers co-star Jennifer Lawrence delighted students with a surprise visit to the Ghetto Film School, an award-winning non-profit in New York City. 5. Honoring Dad: Pratt's father Daniel Pratt died at age 60 after a battle with multiple sclerosis in 2014, while the actor was while filming Jurassic World. In 2016, just before Christmas, Pratt helped break ground on the new Dan Pratt Memorial Teen Center, part of the Boys & Girls Club of Snohomish County, Washington, and donated $500,000 to the group. 6. Thank You for Your Service: In 2015, on the 14th anniversary of 9/11, Pratt posted a Facebook video about Mike Day, a former Navy SEAL who was shot 27 times during a raid in Iraq, leaving him with a brain injury and chronic pain. At the time, the military vet was training for what the actor described as "the most difficult race on the planet," the Kona Ironman World Championships and was promoting a fundraising initiative to benefit the Carrack Brain Center in Dallas, Texas, which is where he and many other fighters were treated. Pratt said he donated $10,000 to the cause and encouraged fans to donate as well. "No matter where you land politically in terms of our countries involvement in foreign affairs, or the two wars we've been in post 9/11, there is no doubting the courage and valor men like Mike Day have shown," the actor said. "He is a warrior in the true sense of the word." "In America we may have our opinions, we don't always agree and our voices are loud," he continued. "But 14 years ago we were reminded that deep down we are not divided, we are united and strong. We've got each other's backs, despite our differences and will continue to as we move forward....United we can take the necessary steps toward leaving the war behind overseas and here at home." 7. Superdad: Pratt is also a superdad to his and ex Anna Faris' 5-year-old son Jack. The child was born premature. His dad is a longtime supporter of the March of Dimes charity, which helps protect mothers and babies' health by working to prevent premature births, birth defects and infant mortality. "I've done all kinds of cool things as an actor: I've jumped out of helicopters and done some daring stunts and played baseball in a professional stadium," Pratt said at a 2014 luncheon for the foundation. "But none of it means anything compared to being somebody's daddy."